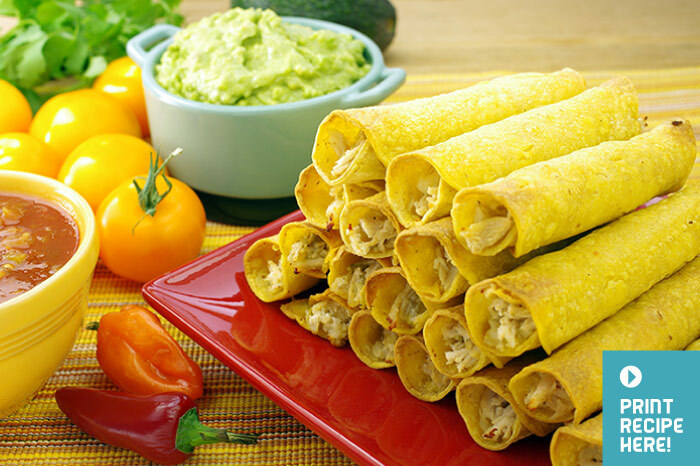 Taquitos (which means “little tacos”) are a popular antojito (appetizer) in Mexico. They are made of corn tortillas with a little bit of filling that are rolled up into a fat cigar shape. 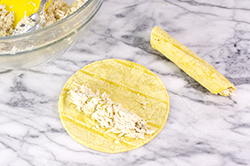 The subsequent deep-frying keeps the tortillas rolled, and gives them that delicious crispy texture. 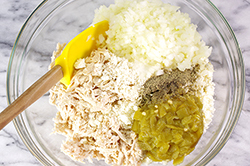 Here’s a simple recipe with chicken that makes a wonderful after-school snack for the kids, with some chunky avocado dip and/or your choice of salsa on the side. 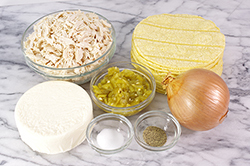 In a large bowl, combine the chicken, cheese, onion, chiles, oregano, salt, and black pepper and toss to mix. In a heavy skillet, heat 2 tablespoons of vegetable oil over medium-high heat. 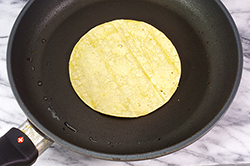 Cook the tortillas, one at a time, in the hot oil until they are soft and limp, about 5 seconds on each side. Stack the tortillas between layers of paper towels, keeping them warm by covering with a kitchen towel. Spoon about 2 tablespoons of the chicken mixture in a line across the lower third of each tortilla and roll them up tightly. Lay seam-side down on a plate or platter. In the same heavy skillet, add oil to about 1/2-inch deep and heat over medium high heat. Fry the taquitos, seam-sides down (five or six at a time, depending on the size of your pan). Cook until golden brown all over, about 2 minutes on each side. Drain on a paper towel-lined plate or platter and continue until all the taquitos are cooked. VARIATION: If you’re watching your health and don’t want to deep-fry these, bake them instead. Preheat the oven to 425°F. While the oven is heating, line a baking sheet with foil and coat with a light spritz of oil. Lay the taquitos, seam-sides down, on the sheet, making sure they don’t touch each other. 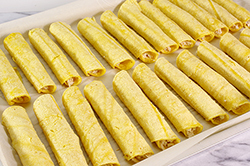 Coat the taquitos with cooking oil spray and bake until crispy and the ends start turning golden brown, 15 to 20 minutes.